c.Booth Charcoal Foaming Dry Body Polish & Cleanser is a double-action polish and cleanser that packs some serious purifying power! Finely granulated Charcoal and Pumice are reminiscent of a soft-powdered beach between your fingertips. These detoxifiers get right to work, polishing and purifying for a perfectly so-smooth finish. Work over skin to form a delicate foam for the added benefits of a detoxifying cleanse-in-one purifying step. Free of Parabens, Sulfates, Mineral Oil and Petroleum. Ingredients: Pumice, Water/Aqua/Eau, Propylene Glycol, Sodium C14-16 Olefin Sulfonate, Musa Sapientum (Banana) Fruit Extract, Cocos Nucifera (Coconut) Extract, Zingiber Officinale (Ginger) Root Extract, Psidium Guajava Fruit Extract, Cymbopogon Schoenanthus Extract, Carica Papaya (Papaya) Fruit Extract, Maranta Arundinacea Root Extract, Rubus Idaeus (Raspberry) Fruit Extract, Santalum Album (Sandalwood) Extract, Macrocystis Pyrifera Extract, Nasturtium Officinale Extract, Aleurites Moluccana Extract, Charcoal, Sucrose, Cocos Nucifera (Coconut) Oil, Butyrospermum Parkii (Shea Butter), Theobroma Cacao (Cocoa) Seed Butter, Juglans Regia (Walnut) Shell Powder, Prunus Amygdalus Dulcis (Sweet Almond) Oil, Disodium EDTA, Phenoxyethanol, Methylisothiazolinone, Iodopropynyl Butylcarbamate, Fragrance/Parfum, Benzyl Benzoate, Geraniol, Hexyl Cinnam-aldehyde, Linalool. 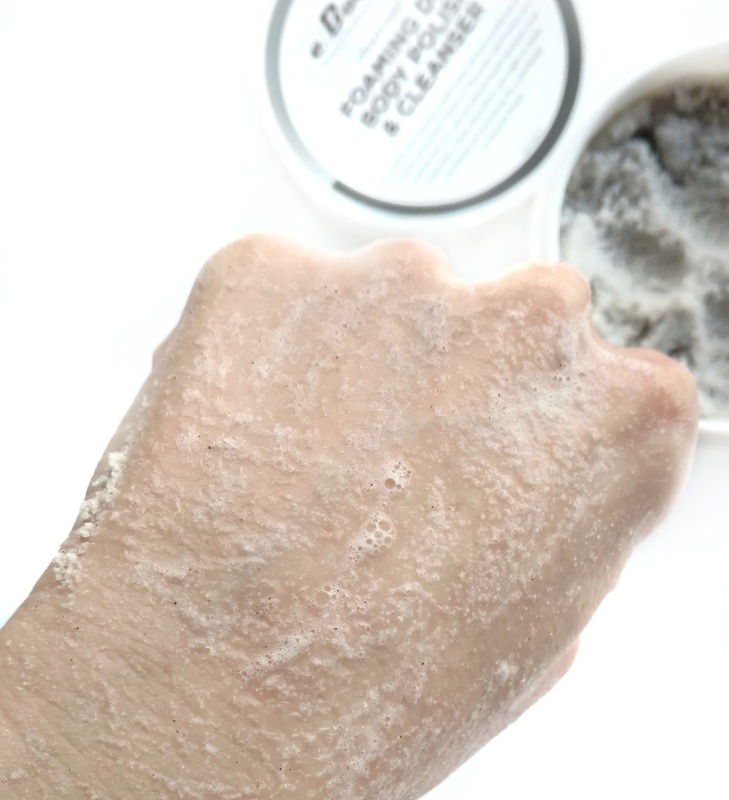 The C. Booth Charcoal Foaming Dry Body Polish is so cool and if you're not a fan of those oily body scrubs, you're going to LOVE this! It contains nourishing ingredients like coconut oil, shea butter, cocoa butter, and sweet almond oil but they're in powdered form (until wet) so they never leave you feeling greasy. 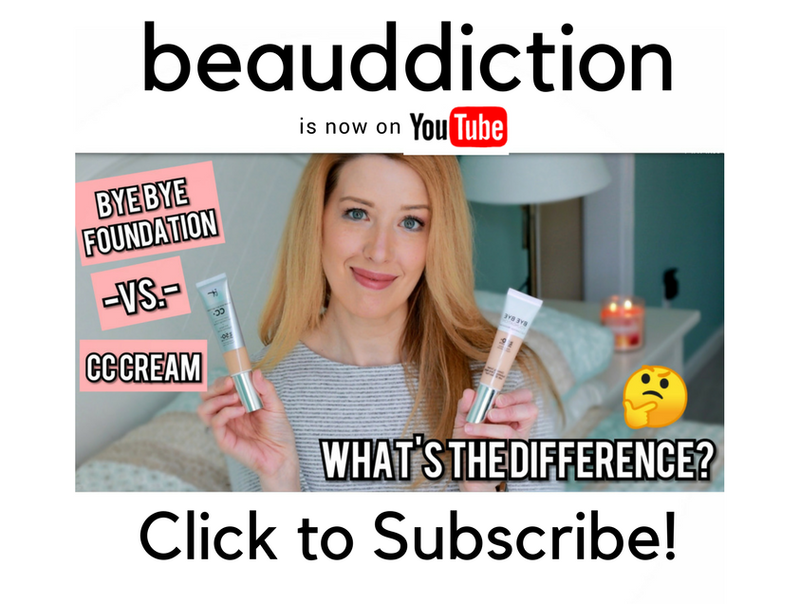 When it's dry, the scrub feels like super soft sand from the beach, but when wet, it turns into a very fine paste that foams up when activated by water. 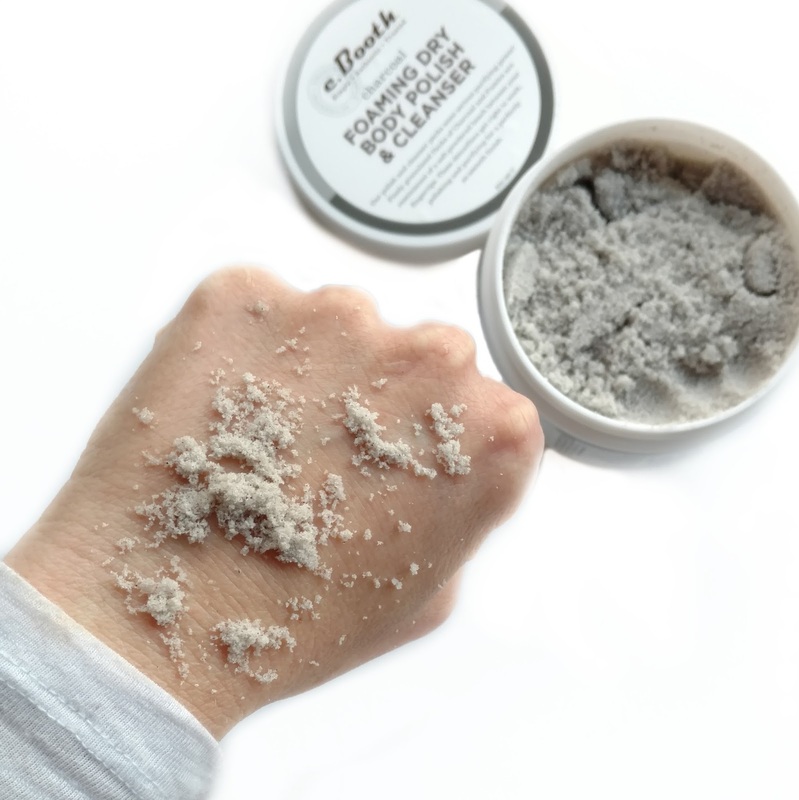 The grains are so small, they make for a very gritty and effective (yet not scratchy) scrub that removes absolutely all traces of dead, dry skin. After using this, my skin feels so super smooth and one thing that this has that other scrubs don't, is that my skin also feels clean. When you add water and the scrub foams up, it becomes very easy to spread (kind of like an exfoliating body wash) so I feel like I'm cleansing at the same time. In my experience, most scrubs are chunky and hard to spread so they fall off in clumps all over your shower floor. Don't get me wrong, this one is a bit messy, but once it's on your skin it clings better and does a fantastic job at both cleansing and exfoliating. It has even gotten rid of those annoying little bumps on the back of my arms and on my legs. It has a fresh, marine-like spa type scent that's pretty strong, but I love it so I don't mind. The major downside with this scrub is the jar packaging. I can't take it into the shower with me or scoop it out with wet hands, because the minute water touches the powder, it starts to activate, so you really don't want to get any water into the jar. Not so easy, right? The first way is if I just want to exfoliate my legs (which is most often), I just sit on the edge of the tub, get my legs wet, and use a dry hand to scoop out what I need. If I want to use this in the shower, I transfer some into a different container or bowl to bring into the shower with me. That way I won't get the whole tub of product wet. They're minor annoyances, but this scrub is definitely worth the hassle. Still, I won't complain at all if C. Booth decides to come up with packaging that makes life a little bit easier! This is what it looks like when activated with water. If you can get past the inconvenient packaging, I highly recommend that you give this scrub a try! It's one of the most effective body scrubs I've tried and doesn't leave the oily residue that a lot of oil-based scrubs do. I love how smooth and clean my skin feels after using it! 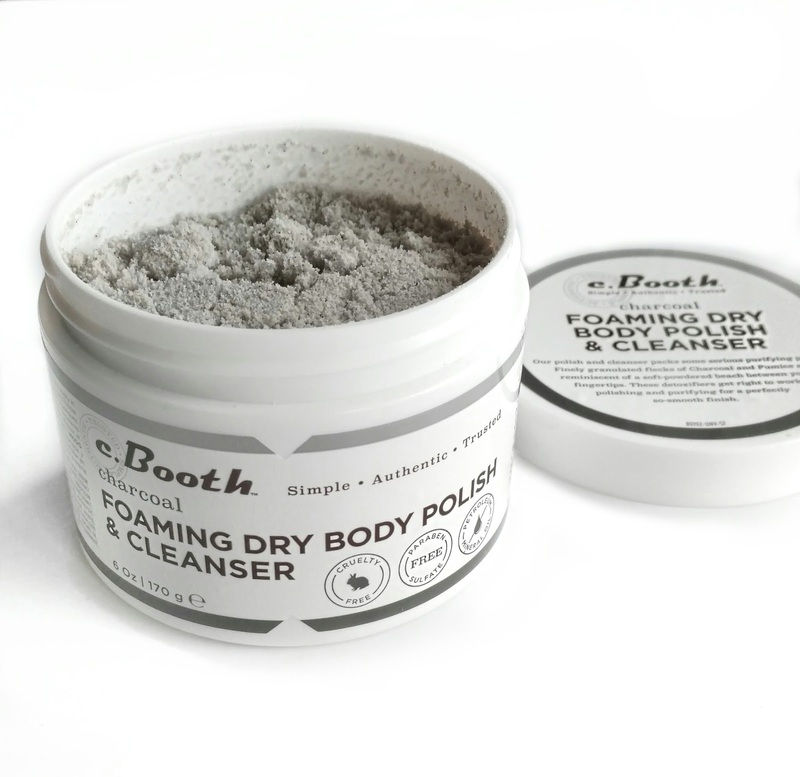 Have you tried the C. Booth Charcoal Foaming Dry Body Polish & Cleanser yet? I'd love to hear your thoughts in the comments below! Disclosure: Product was purchased by me. This post contains affiliate links. This looks cool, although I can see how the jar packaging would be pretty inconvenient for this type of product. I really wish c. Booth would bring back the Ultimate Anti-Aging Cream and the Licorice Eye Cream. I repurchased those many times and even resorted to getting overstock off ebay once they stopped producing it. It seems like the brand almost totally disappeared for a while, then came back but only with body products. As for those annoying arm bumps, I have them too and they drive me nuts. The only thing I have found that works on mine is the Tea Tree Face Cream by Thursday Plantation. I found it out by accident as the cream stung my face so I couldn't use it as advertised. I have tried other tea tree creams on the arm bumps as this stuff is a little pricey, but only the Thursday Plantation stuff did anything. So I wonder if there's a different ingredient in that particular cream that does it? Lastly, I think you mentioned recently that you use AHA cream / gel on your arm bumps sometimes – anything in particular to recommend? Could you put some into a shaker top container, like the Kraft Parmesan cheese containers, and just shake it out into your hand in the shower? That should keep it pretty dry and allow for some degree of control and how much you are using. Just a thought. Sounds really interesting! I wonder if this would be a good scrub to use before applying self tanner. I always want to scrub first but most leave a residue that can block proper self tanner application. 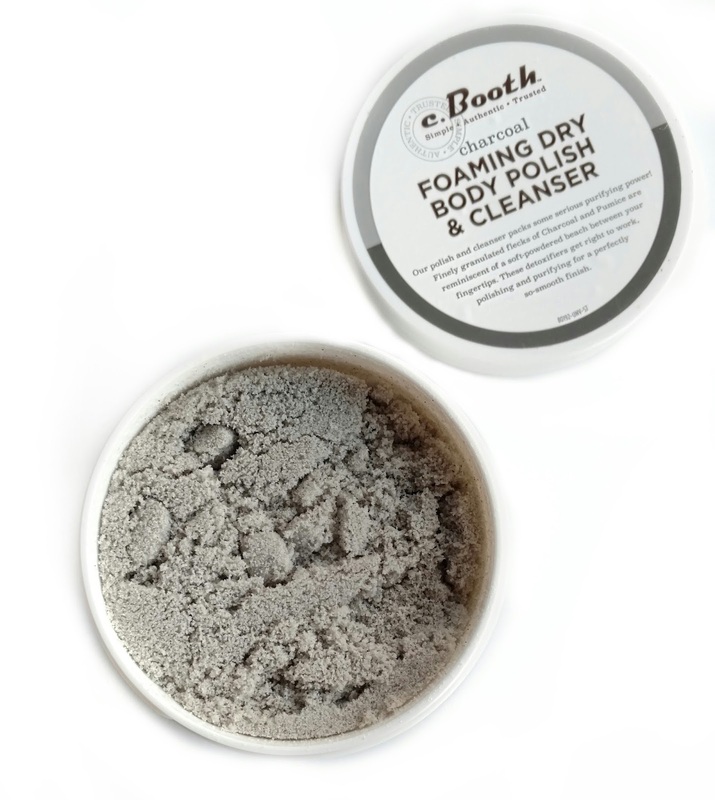 I love the c.Booth Charcoal Foaming Dry Body Polish & Cleanser! You simply scoop some in your hand and it lathers up when rubbed onto wet skin. The fragrance is amazing too and my skin is so soft to the touch! I do like the idea of a shaker package for this item. I visualize a shaker with medium sized holes to dispense the product.